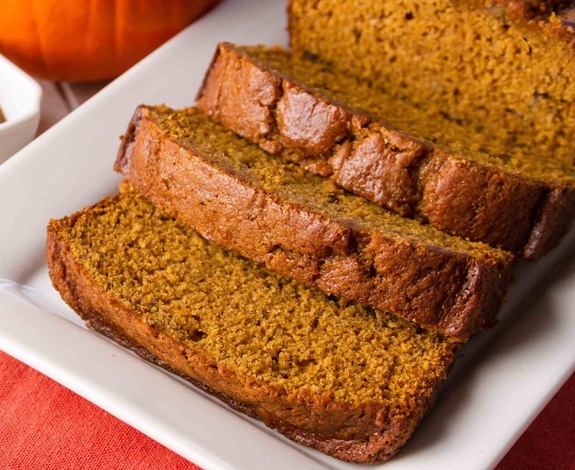 Nutritious wonderful food masquerading as a treat…ground almonds flour, eggs, pumpkin puree. And low carb. Preheat oven to 300 degrees F/ 185 C.
Grease a 9 x 5 loaf pan well (may wish to also line with a 9 inch wide strip of parchment paper covering the long sides). In a bowl whisk together the almond flour, sugar substitute, baking powder, pie spice, and salt. In another bowl, beat the eggs and then whisk in the pumpkin and vanilla. Combine the dry and wet ingredients and stir until combined. Pour the batter into the prepared pan and stir to combine. Bake until golden brown and a toothpick comes out clean when stuck in the center, about 1 1/2 hours. Slice into 8 thick slices and then cut each of those in half to make 16. Posted on the web by George Stella.